The Planning Department’s Central Waterfront/Dogpatch Public Realm Plan identified needed amenities in the area resulting from both missing infrastructure and the pressures of new development in the area. The Planning Department process, led by Robin Abad, identified Esprit as one of the key sites in need of upgrades and renovation. Fletcher Studio’s preliminary concept design for Esprit and the related Planning outreach that led to development of the plan have been accepted by RecPark as the project’s official initial outreach phase fast-forwarding the project into its construction document phase.. Contractual agreements between UCSF (as donor of a significant portion of the renovation funding) and the GBD (as the non-profit recipient of those funds), and between the GBD (the executor of at least a portion of the project) and RecPark (as the owner of the property and responsible City department) and between the GBD and Fletcher Studio (as project designer) are being negotiated. 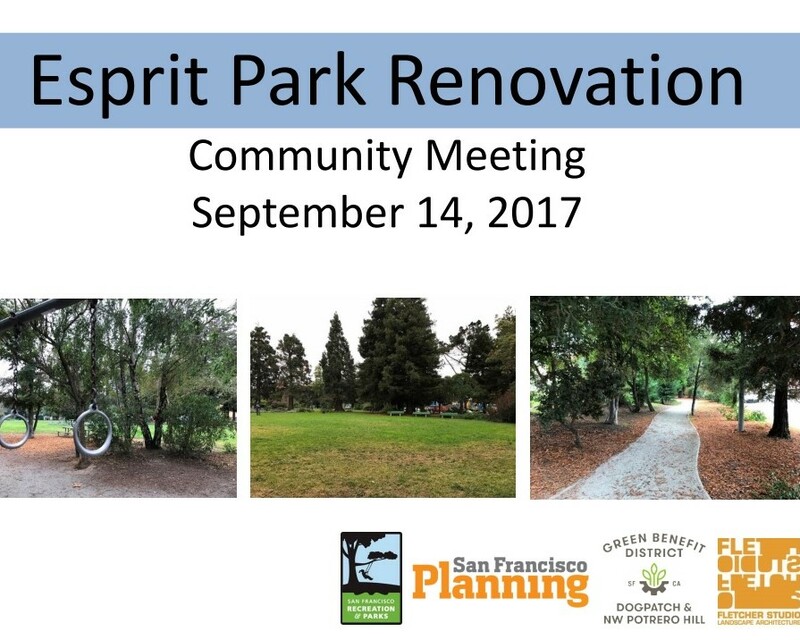 A community meeting was held on Thursday, September 14, 2017 covering these topics: • Recap of the Planning Dept-led Esprit Park Design • Transition from the Planning Dept-led design process to RecPark- and GBD-led project delivery • Project team members and roles • Initial project timeline • Community engagement plans • Answer questions and outline next steps. The meeting presentations can be downloaded on the left. Memorandum of Understanding between UCSF and the GBD The current plan is for UCSF to transfer the $5 million in Esprit-related cushioning funds to the GBD as the project advances. The GBD will use these funds to plan and execute the renovation of Esprit, whether through City or private sector entities. The GBD will extract only the minimum amount of those funds needed to cover the costs of fulfilling their obligations regarding the project. Any extracted fees will be based on actual costs and will be designed to insure that this project is self-financing and does not unfairly redirect GBD stakeholder funds to the project. The terms of that MOU will contain reporting and outreach responsibilities as required by UCSF (and similar to requirements typical of grants and donations). This MOU will be a public document. Grant Acceptance Agreement between RecPark and the GBD The execution of the project is somewhat complex. This phase requires surveys, reviews and reports, permits and approvals. RecPark and the GBD are discussing the most efficient and effective divisions of labor. These discussions will lead to an MOU between the GBD and RecPark that will determine project responsibilities and how the project will be managed and executed. Those responsibilities will be shared with the public prior to being presented to the RecPark Commission. So far, the bulk of the identified funding is coming from UCSF’s cushioning bequest, which resulted from 8 months of hearings and negotiations between UCSF and the Dogpatch Community Task Force. An additional $2.7 M has been earmarked from development impact fees. The total project budget and other potential sources of funding are still being determined. Current (very rough) estimates target a completion date in 2020, though we would like to compress that delivery schedule. The actual active construction time will likely be 6-8 months. With its large lawns, the park may also need some regeneration time between completion and opening. The proposed plan for Esprit Park was developed and vetted by community members through a Planning Department-led process with extensive outreach. This plan has been provisionally accepted by the RecPark Department. The purpose of the current phase of the project is to translate that community-driven plan into a final concept plan and construction documents that will shape the renovation. Changes to the plan will occur only if discoveries about site conditions, regulatory reviews, budgetary restraints etc. force adjustments. And, even then, the goal is to steer as closely as possible to the original plan. The Esprit Park Community Advisory Group has two functions: To provide community-based feedback as the plan develops and to carry information about the progress of the project back into the community. The Advisory Group is not a voting body and has no veto authority over the project. But Advisory Group members will have the opportunity to meet directly with City staff and project consultants and to learn about and comment on the plan as it evolves. The meetings will be noticed through the GBD website and monthly blasts and open to the public.